Here are some facts about the Sagrada Familia. The Sagrada Familia is a large Roman Catholic church in Barcelona, Spain. The building was started in 1883, but it won’t be finished for at least another 30 years. The church is regarded as the masterpiece of the Spanish architect Antoni Gaudi. Gaudi designed many buildings in the Barcelona area, and is known for his distinctive and colourful works of art. The finished building will be able to accommodate up to 13,000 people. It will measure 312 feet long and almost 200 feet wide. 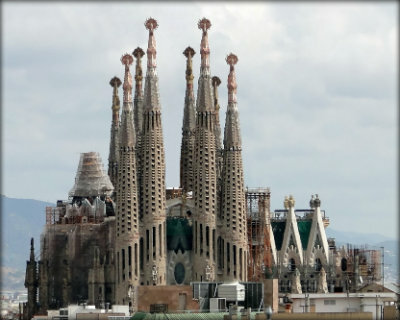 When finished, the Sagrada Familia will have 18 towers, each of which represents a person. 12 of the towers will represent the apostles, and 4 of them will represent the evangelists. The church’s tallest tower, at almost 600 feet, will represent Christ. However, it will deliberately be a few feet lower than a nearby hill, as Gaudi believed that God’s creation should be higher. The church has three facades, with themes of the Glory, the Passion and the Nativity, each of which has complex symbolism. The Passion façade contains words from the Bible in different languages. From 1911 until his death, Gaudi worked tirelessly on the design of Sagrada Familia. He lived and worked as a hermit in a workshop on the site. Gaudi died in 1926 when he was run over by a tram and is buried in the crypt. A small museum shows visitors the ongoing history and construction of the church, and the life of its architect. Miraculously, Sagrada Familia was not damaged during the Spanish Civil war. However, Catalan extremists did destroy many religious models and plans. Although the church attracts several million visitors each year and is one of Spain’s most popular tourist attractions, not everybody likes the design.